Today I rode my bike to Missionhurst, a hidden retreat in the midst of Arlington, hauling yoga supplies on my Burly trailer. Up and down the hills of 26th Street I arrived sweaty for my first-ever silent meditation retreat…about time!! The day was structured with periods of sitting in guided meditation, sessions of very slow gentle yoga, and walking the verdant grounds to contemplate as each of us desired. Birdsong and insect twitter, the lullaby shusssshhhshshshsh of leaves in the breeze, and maybe a crunch underfoot. And then the surprise of wind chimes hung from a tree, their lovely tones in the air current. Amazing – it is so easy to slow down and find this restful space. No hurry. No stress. Just thoughts and observations, and feelings in my body and in my heart and on my skin. The shady outdoors is perfect – not too hot, or humid: nature’s palette of greens and browns. The green tones are so similar, but the diversity of leaf shape and pattern are astonishing. Things to see only when I’m slowed down enough to look. Doing Natalie Goldberg’s “slow walking” – so nice – not impatient with it. There is nowhere else to be. Nothing else to do. But feel, and let the thoughts filter through. Not drilling into them, just letting them float up, be considered, float away. Thick tufts of grasses – in clumps, sprouting up from the soil. A hosta – leaves broadening out to a pointed tip, lines along their length as though, while moist and unformed, someone drew a comb through each. Rounded heart-shaped leaves of violets. Clumps of bamboo-like grasses. A weaving of English ivy – contrasting vein running to each pointed tip of the leaf, miniscule stars of spreading moss, and interspersed a more spiky moss – looking soft and cool. Bright shamrock leaves poke out. All peacefully coexist. And the splendid ferns, each thread extending, so fragile, yet somehow strong enough to support a spray of delicate leaves. And some other fern, with larger, sculpted leaves, smooth and broad. There is plenty of brown earth, and little rocks and pebbles, tree roots bulging up, fallen twigs and dead leaves. I don’t know what trees I’m seeing – cedar? Black walnut? As I walk along the path I come to groves of bamboo – and it’s cooler – instantly, and quiet. I grab the shafts of two bamboo poles – so green and smooth – one in each of my hands, small flies dot their segmented length, unmoving, even as I undulate the bamboo stalks, whose tops are stuck on the adjacent deciduous tree. And there, near the ground, one lone sprout of a holly bush, its waxy leaves shiny, each one ringed with a delicate pattern of sharp barbs, shouting DON’T TOUCH. I see the sun shining through the leaves, the one leaf casting a shadow on another. There’s a moment of illusion, as though I’m looking through a green window. I see delicate maples, and ancient oaks, and a monstrous silver maple with it burly rough bark. And the towering giant of a tulip poplar that would dwarf dinosaurs, leaves the size of dinner plates fallen on the path. I caress the leaves of the cedar (if that’s what it is) and a small tough berry lands in my hand. I carry it as I walk, rolling it between my thumbs, strangely comforting. I grasp a wet drooping hydrangea flower – magnificent in its blue contrast to the quieter surroundings, and rub the damp residue onto my face and arms, leaving little specks of its pollen on my skin. Some troubling thoughts emerge, but I let them drift away and return to simple observation of tree branches shifting and bobbing – leaves quivering and bouncing, sun brightening patches of green, shadow darkening others. I’m looking now at the patterns of tree bark – the vertical lines up the cedar trunks, horizontal patches on some other tree that I can’t identify. And another trunk – rough all over, looking whitish and grayish, and another tree whose lower branches have all been cut off, leaving bumpy, painful-looking stumps. Does it still hurt? Did it hurt? There are three crumbling cement steps off the path, leading nowhere. A tiny white insect lands on my arm, content to rest there, but when I examine it, it flies off. A small black insect trundles along the ground, its back sleek and smooth, shiny and straight. I’m surprised I don’t see more – insects – but grateful that they are not buzzing around me biting and ruining my enjoyment of the outdoors. I see two white moths chasing each other and some insect flying…could it be a precious bee? What will we do if we lose our bees? The lunch I just enjoyed with such sweet strawberries and watermelon – their shades of red – the strawberries shiny and pocked everywhere by seeds; the watermelon, like a full sponge, and the small yellowgreen slice of avocado whose creamy smoothness I sliced from its bark-like skin with my teeth. And bright orange carrot soup – so sweet – it must have had brown sugar, but also a hint of spicy, and the crunch of some almonds…such a lovely lunch – filled out by warm cheese, on French bread (yes, ok, white bread) with the contrasting sharpness of Dijon mustard. I have absorbed the green energy of the day, and find myself relaxing into the present – whatever it is, whatever it is, whatever it is. Sometimes riding a bike feels like climbing Mount Everest: not because of the steep climb, but because navigating the route is complex and unpredictable. When you get lost in a car, you might drive in frustrating circles and waste gas, but when you lose your way on a bike, you pay in muscle, breath, and sweat. But it’s all part of the journey, and often the only way to learn a new route is by trial and error. For months, this weekend has been marked on my calendar as the high point of my summer writing: a two-full-day workshop with the extremely likeable Kathleen Flinn, food writer extraordinaire. Okay, I haven’t actually read her books, but they’re now on my list. Traveling from my home in Arlington, Virginia to the Writer’sCenter in Bethesda, Maryland (the workshop’s location) is inconvenient by any mode of transport. Driving entails either going around the dreaded Washington beltway or through the traffic-clogged streets of D.C. It could take anywhere from 20 minutes to over an hour, depending on traffic. Taking the Metro entails two trains and two walks, and on a weekend one must expect it to take well over an hour, and possibly much longer due to frequent weekend track work. The best option (as usual) is to bike – a 10-mile ride – the same distance I regularly ride to work. But there’s a difference. When I ride to work, I know where I’m going. At any point in my ride I know exactly how much farther I have to go, where the hills are, where the traffic is bad, and so forth. But I’ve only biked to Bethesda occasionally, so it still feels like uncharted territory. My plan was to take Arlington streets to Chain Bridge. 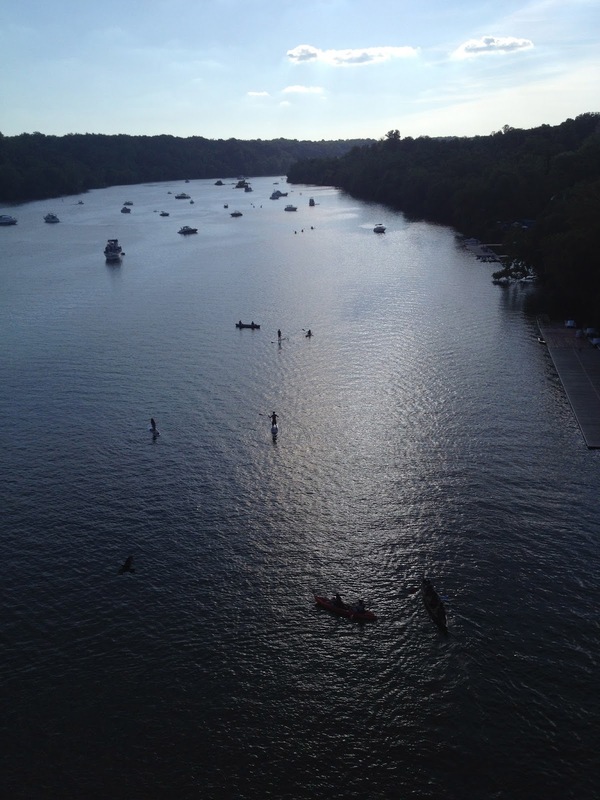 From there, the Capital Crescent trail runs to within four blocks of the Writer’s Center. This route entails riding up some of Arlington’s biggest hills, but they would come early, while the temperature was still cool. And at 7:15 on a Saturday morning I wouldn’t need to worry about getting whizzed by cars approaching Chain Bridge on the narrow, shoulderless road. 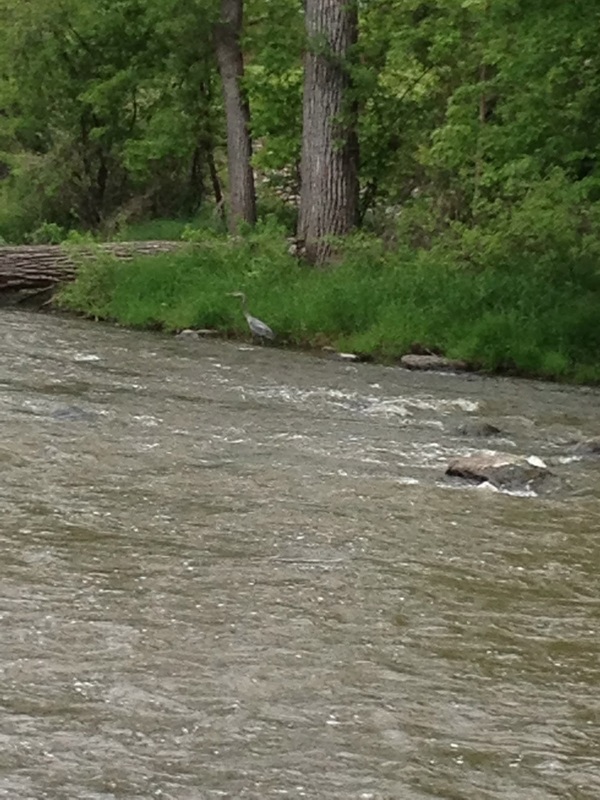 The biggest hazard is the required stretch of the C&OCanal Towpath. This route was not designed for bicycle convenience. After crossing Chain Bridge, a ramp descends to the Towpath – a rough and rocky unpaved trail that I find hazardous with my skinny tires. One must ride about a mile the wrong direction down the Towpath, which, for me, is slow and nervous-making, leaving my wrists and arms aching from their death-grip on the handlebars. But it’s worth it, because the lovely Capital Crescent is a summer delight – the most thoroughly shaded path I get to ride in this area. While it looks flat, the path is, in fact, completely uphill from D.C. to Bethesda. Still, the grade is low enough that it doesn’t feel challenging. The workshop was engaging, but the day was long, with too much sitting. So I eagerly anticipated my bonus ride home, knowing I’d get that rare treat of an eight-mile slide down the gently sloping trail. And what a treat it was. Shady, gliding effortlessly, I rode to Georgetown, over Key Bridge, and took the bus home the final uphill stretch. This was a completely new route for me, which is why I ended up thinking a bicycle Sherpa would have come in handy. As I approached Georgetown, there was a set of cement steps, with wide curbs, presumably for pushing up a bike. It was a steep push, but I made it to the top, disappointed to see that it took me back to the rough Towpath. But I could see Key Bridge in the near distance, and didn’t have to ride it nearly as long as I had on the segment from Chain Bridge. Again, I saw a cement stairway – this one with no way to get a bike up but to carry it. I don’t have a problem carrying my bike up stairs, but this ascent was unusually steep, with a sharp turn halfway up. 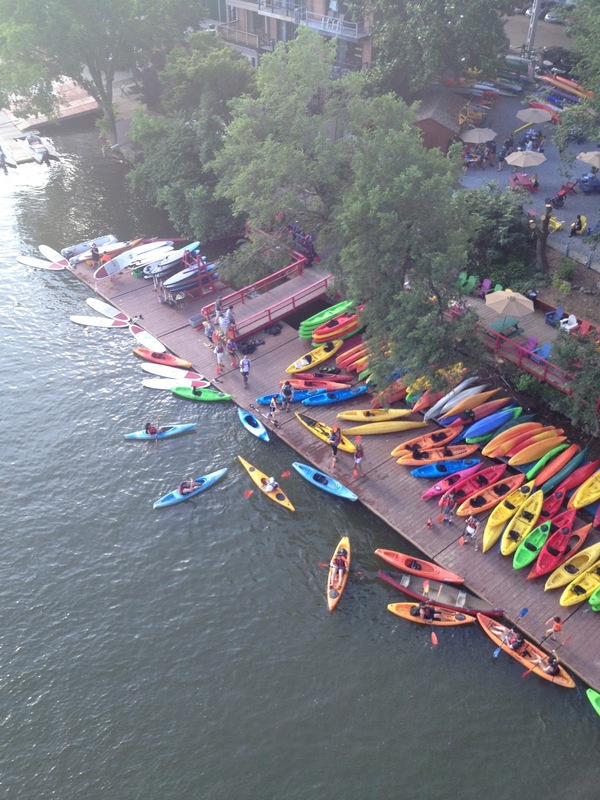 Luckily, it took me just a few feet from the entrance to Key Bridge – success! So while it ended up being a personal navigation victory, it saddened me that there was nary a trail marking. Surely this is a heavily traveled route, and perhaps there’s a better way that I have yet to discover. Would it really be that difficult to have a sign here or there, pointing the way to each trail or to the bridges? If there’s an enterprising and intrepid bicycle Sherpa out there, give me a holler. I’ll be your next customer. When my daughter was young, she called the state of my origins “Moosconsin.” One need not travel far in America’s Dairyland to encounter bucolic pastures populated by Holstein cows and, to this day, I continue to hear her little voice saying “Moosconsin” when I go for a visit, as I did over Memorial Day weekend. 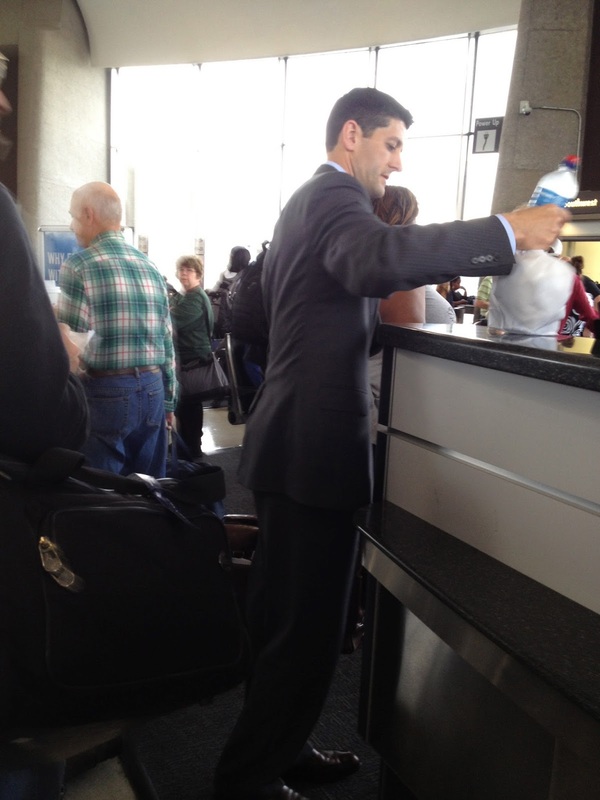 I was worried the trip was off to an inauspicious start when I discovered that Paul Ryan was sharing my flight from D.C. to Milwaukee. This photo shows him insisting that they move him OUT of 1st class and into a coach class seat. I'm sure someone on the packed flight was happy to switch. I was just relieved that we weren't seatmates, as it might have gotten me thrown off the plane (in mid air). I arrived in Milwaukee for my sister-in-law’s art show and book signing at the Grand Avenue Club – a community that provides support for people with mental illness. Located downtown, I booked a room at the Metro – a beautifully renovated art deco hotel that I chose online because it offers its guests FREE BICYCLES to use during their stay! As I was arriving just before the show and leaving early the following morning, I didn’t actually get to use a bike – but I let them know that the availability of bikes was the determining factor in my choice of their hotel (and it also was walking distance from everywhere I needed to go). 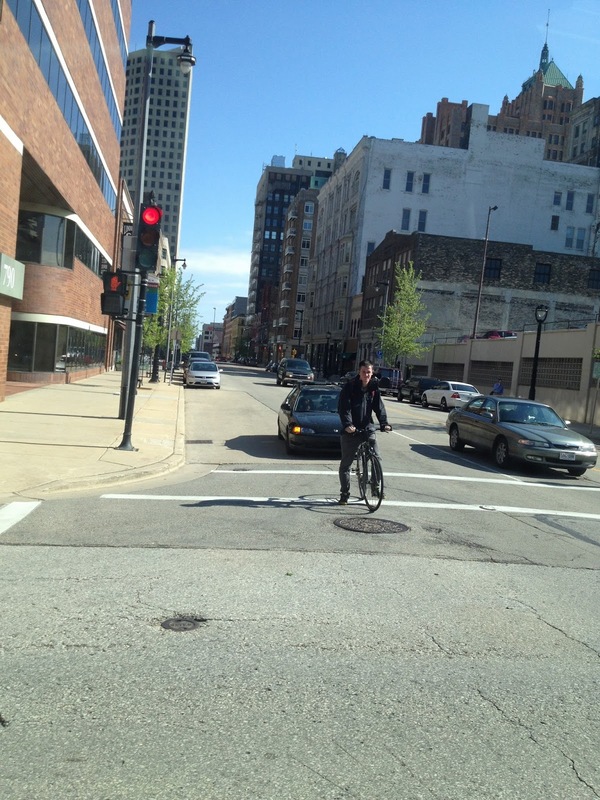 I wouldn’t say Milwaukee’s streets were clogged with cyclists, but I did see plenty of folks riding the city streets, despite the absence of much in the way of biking infrastructure (at least that I noticed). The next morning I walked to the transit station to catch a bus to Baraboo (home of Circus World Museum and proximate to Devil’s Lake StatePark) where my mom and stepdad live. My 86-year-old mother planned in advance, and had borrowed a bike from one of her younger (~ 65-year-old) friends. It looked like it had NEVER been ridden, so I felt I was doing the bike a favor to take it out for a spin each morning. It came complete with detachable basket, rearview mirror, lock, and helmet. 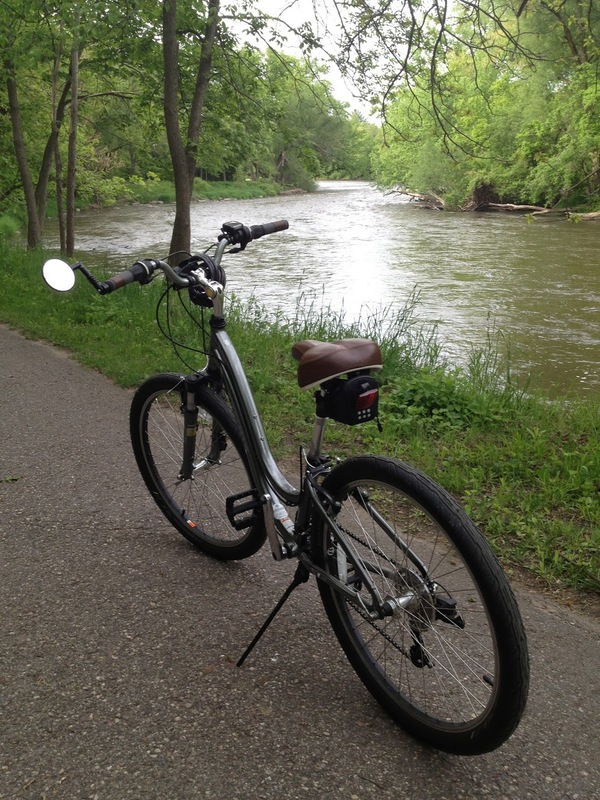 The weather was cool and drizzly, but I was able to make a pleasant 5-mile round-trip ride each morning, taking Baraboo’s very own multi-use path that runs along the Baraboo River. I heard more birds than I saw, but did manage to catch sight of a lovely pair of goldfinches and a majestic great blue heron. I had aspirations of biking to the state park, but the weather was iffy and the hills a bit daunting (especially on the “granny bike” I was using). So a bike trip to Devil’s Lake will have to wait for another visit. No matter how old I get, there’s a certain regression that overtakes me whenever I visit my mom. Upon entering the house, I check the contents of the refrigerator and the kitchen cabinets. She always has favorite snacks, homemade cookies, and Wisconsin’s signature product: cheese curds. I take afternoon naps and pretty much just laze around. 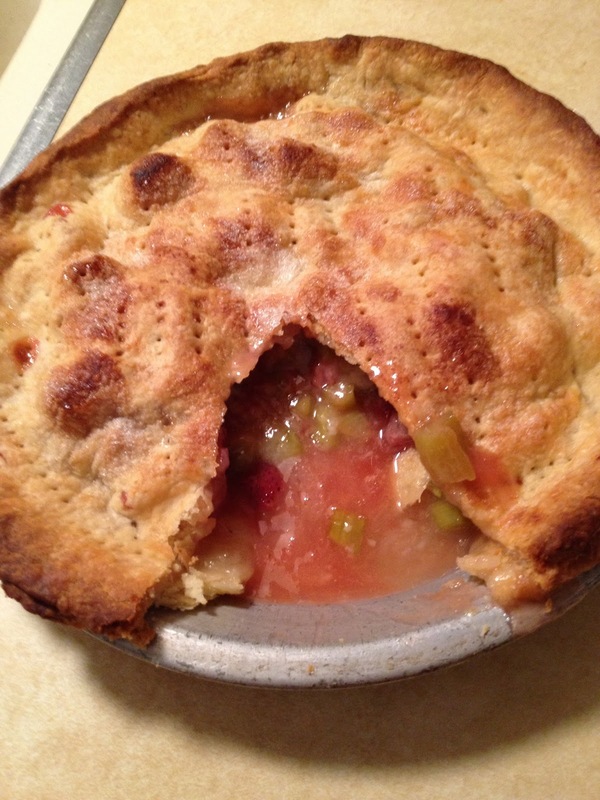 We went to the Saturday morning farmer’s market, where they had rhubarb that my mom used to make strawberry-rhubarb pie and blueberry-rhubarb sauce (which I sampled over both plain yogurt and vanilla ice cream…delicious with both). After four days in Baraboo, my folks drove me to Madison, where I caught a flight to Las Vegas for a short business trip. 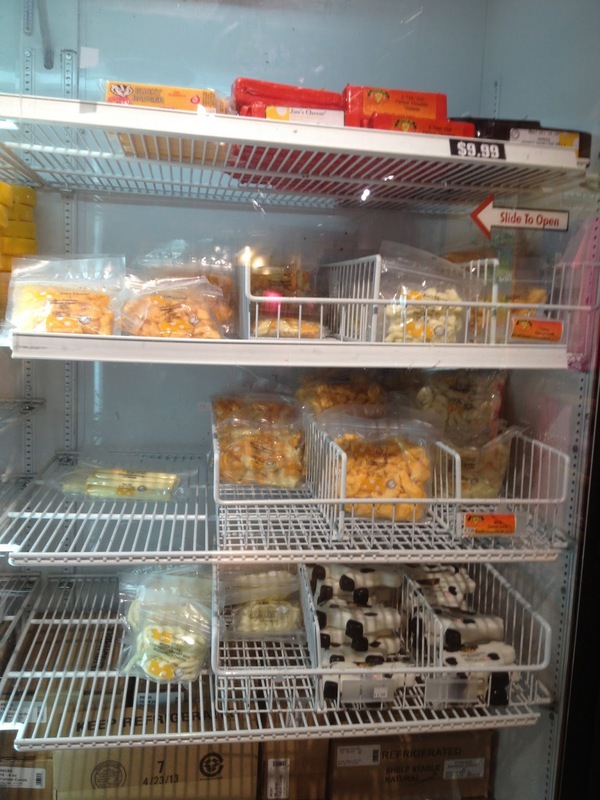 The Madison airport featured an ample cooler filled with cheese products and the bathrooms offered free tampons and sanitary pads. Go Madison! 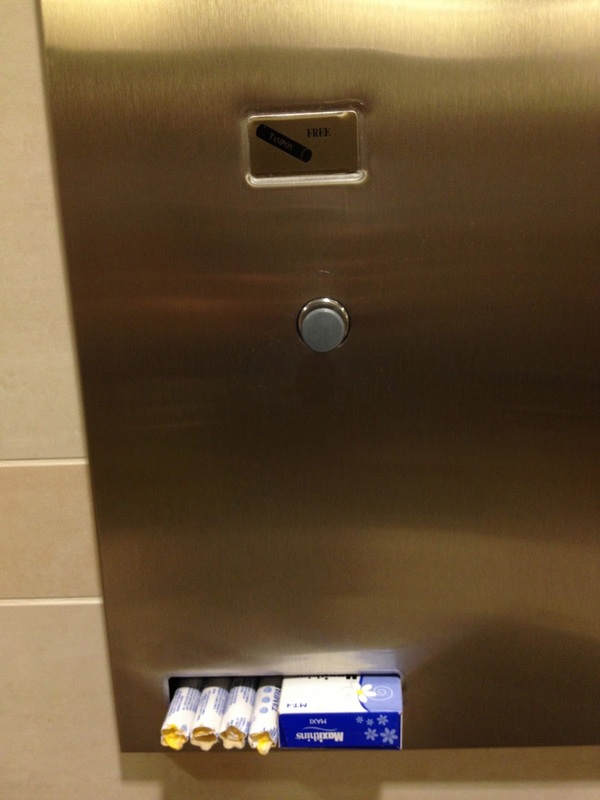 Even though I’m well beyond the age of needing these products (the tampons, not the cheese), I still appreciate places that give them away free of charge. Las Vegas is not exactly a bike-friendly city and thankfully I was there for just one day of work. I was put up in the fancy Aria casino/resort and, because of the time difference, was up early to enjoy a lovely 2 hours in the fitness center/spa before my meeting. The workout with a full array of weight machines convinced me to join a gym on my return to D.C. as a way to get my final bit of shoulder rehab accomplished. The Aria also had a “meditation” room on which you could lie on heated granite slabs while serenaded by soft music and another room with walls built of salt blocks. In the salt room, large leather divans vibrated to the rhythm of the gentle music. I don’t know whether there’s any science behind breathing salt air or lying on heated granite, but I felt quite blissed out by the time I left. My favorite treat, however, was using the large eucalyptus-scented steam room, which I could alternate with a plunge in a cold soaking tub. Heaven! 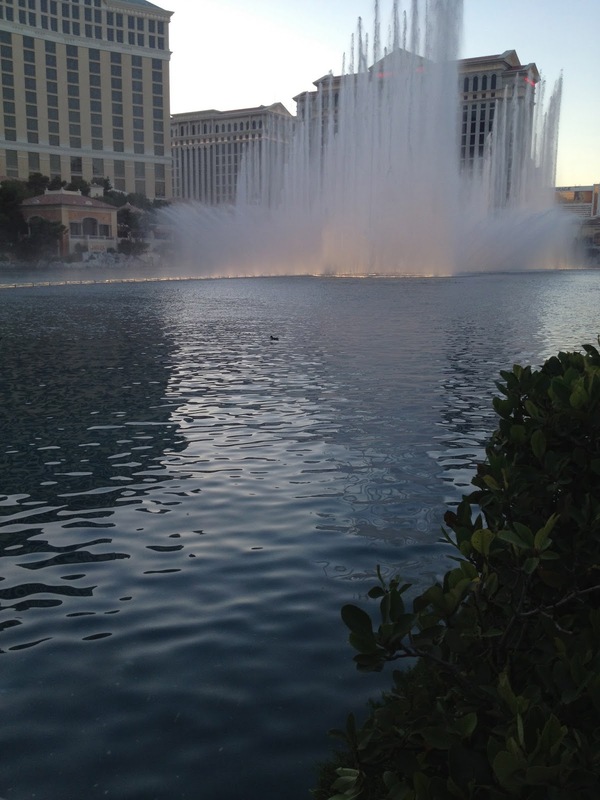 After my workday was over, I decided – well – Vegas – might as well take a brief foray into the casino. In four rounds of roulette I came away $150 richer, winning money by placing chips on my daughter’s and my birth months. Fortunately I know how to walk away while I’m ahead, figuring I’d done well for my 10 minutes of gambling. After a long, cramped plane ride home the next day (thanks United – NOT) I went for my first post-surgical swim – delighted that I can still do a mile and the shoulder felt great!